In the description of uniform 'Scout Colours' refers to the traditional colours of Khaki, Blue, Green or Grey (with variation in shade allowed). Where options are provided, with the exception of Scouters/Officers the option chosen must be uniform within a Section. 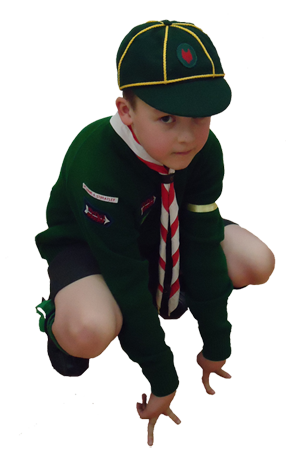 Wolf Cub Scouters/Junior Scout Officers wear uniform as described for all Scout Group Scouters/Officers within the Scout Handbook. Wolf Cub Scouters/Junior Scout Officers, wear uniform as described for all Scout Group Scouters/Officers within the Scout Handbook. Neckerchief, Wolf Cubs wear neckerchiefs of Group colour worn with a woggle. Wolf Cub Scouters/ Junior Scout Officers, when they are with their Group shall wear the neckerchief of the Scout Group. When Scouter/Officers are not with their Group they may wear either their Scout Group neckerchief or the 'Order of World Scout' neckerchief for those holding the 'Wood Badge' issued by the 'Order of World Scouts'. In Uniform a cloth badge with the letters BBS or BGS superimposed in red on a white arrow with a black ground, worn mid-point between elbow and shoulder of the right sleeve; A cloth badge with a Red Wolf Head motif on a Scout Green background or White 'Peace Lily' Fleur-de-lys on a blue background (for Junior Scouts only) at the discretion of the Scout Group but must be consistent throughout worn on the left breast of the shirt or blouse. Two general proficiency badges-First Star/Steps and Second Star/Steps. Junior Scouts. The Tenderfoot (a cloth badge with the letters BBS or BGS superimposed in red on a white arrow with a black ground) is worn mid-point between elbow and shoulder of the right sleeve. The Beret NPS Badge (a cloth badge with a white Florentine lily on a navy blue ground) is worn over the left eye on the beret. (2) The First Star (Wolf Cubs) is worn on the cap on the right of the Wolf's Head. The First Steps badge (Junior Scouts) is worn on the left sleeve mid-point between shoulder and elbow. (3) The Second Star (Wolf Cubs) is worn on the cap on the left of the Wolf's Head. The Second Steps badge (Junior Scouts) is worn in place of the First Steps badge. The Troop Yell in the Tenderfoot Test is replaced by the Grand Howl in the Wolf Cubs Tenderpad Test. The Wolf Cub Salute, or The Junior Scout Salute. The Grand Howl, or The Troop Yell. Leap over another Wolf Cub/Junior Scout of the same size. Throw a ball six times so that a Wolf Cub/Junior Scout ten metres away can catch it. Catch a ball, both hands together, thrown to him/her from a distance of ten metres, four times out of six. Walk upright and with a good carriage, carrying a solid article weighing about 1kg. on his/her head without using his/her hands, for a distance of ten metres; turn and come back to the starting point. A Wolf Cub/Junior Scout cap may be worn. Clean a pair of boots or shoes, fold his/her clothes neatly and satisfy his/her Cub Master that he/she is doing his/her best to keep the Wolf Cub Den/Junior Scout Hut tidy and to leave no litter anywhere. Have at least three months satisfactory service as a Wolf Cub/Junior Scout. Re-pass the Tenderpad/Tenderfoot test. This test to be taken last. Swim 15 metres, or skip with both feet together 15 times forward and 15 backward, the Wolf Cub/Junior Scout turning the rope him/herself. Understand the meaning of thrift in all things and be carrying it out in practice. Show evidence of care of his/her Wolf Cub/Junior Scout Uniform. Observe and point out from life three birds (not domestic), three trees, and three other natural things such as insects, flowers, fishes, the choice to be made by the Wolf Cub/Junior Scout in each case. Have at least nine months satisfactory service as a Wolf Cub/Junior Scout. The Leaping Wolf badge will be awarded to a Wolf Cub/ Junior Scout who has gained his/her Second Star/Steps badge and three special proficiency badges, one of which must be the First Aider, Guide or House Orderly badge. This he/she can wear while in the Wolf Cub Pack/ Junior Scout Troop and when he/she goes up into the troop until he/she has passed his/her First Class tests. The Leaping Wolf badge will be worn over the right breast. Make a worthwhile toy or model of reasonable size, such as a boat, engine, motor car, aeroplane or animal or make in reasonably correct proportions and colouring, a worthwhile composite toy or model such as a farmyard, jungle ark with animals, cottage with furniture or railway station or make 2 useful or decorative articles from cans, raffia, wool, leather, wood, string or any other suitable material approved by the Cubmaster/Scoutmaster. Show a good sportsmanlike spirit in all Scout/Cub games and activities. A Wolf Cub Pack must form part of a BBS Scout Group, and the Scout Group must register the Wolf Cub Pack under their Scout Group Registration, as for all Sections. The Wolf Cub Scouters/Officers must apply for the appropriate warrant for their rank, the forms for which are available from the Group Scout Master or from the BBS Headquarters. Please note that a Wolf Cub Pack may be permitted to be formed in advance of a full Scout Group being established with the approval of the BBS Headquarters. The ranks for leaders follow similar to those in the other Sections of the Scout Group and are all warranted posts, in order of rank is the 'Cubmaster' (CM) or 'Lady Cubmaster' (CM), then the assistants referred to as 'Assistant Cubmaster' (ACM) or 'Lady Assistant Cubmaster' (ACM). Junior Scout Troops use the same ranks as for a Scout Troop. The titles or names for the Wolf Cub Scouters/Officers are traditionally taken from 'The Jungle Book' as is the theme for the Wolf Cubs. Therefore the name 'AKELA' must be used for the Cubmaster. Names for Assistant Cubmasters and any adult helpers will be left to the discretion of the Section concerned, but the names that can be selected from are those found in 'The Jungle Book' story, but only using the good, well meaning animal names like - 'BALOO'; 'BAGHERRA'; 'KAA'; 'RAKSHA'; 'RIKKI-TIKKI-TAVI'; 'HATHI'; 'CHIL', as typical examples. The training of Wolf Cub Scouters/Officers follows the same course as for all other Sections, consisting of a 'Preliminary Training Course' (PTC) that will probably be carried out over a weekend, or two day sessions or maybe several evening sessions. At the end of the course a Certificate will be issued and a two-stranded Turk's Head Woggle will be presented. Whilst the above is not compulsory, it is hoped that all Scouters/Oficers will want to become as proficient as possible and will undertake that training. We can all benefit from an exchange of ideas which is inevitably a product of such training. SAFETY ON THE ROAD - The 'Green Cross Code' is an essential part of our Scouting programme and all Wolf Cubs/Junior Scouts should be taught this, and always ensure that when you are out with the Wolf Cubs/Junior Scouts you make a point of being seen to abide by the 'Green Cross Code' to the Wolf Cubs/Junior Scouts. If the situation of your meeting hall is one that the Wolf Cubs/Junior Scouts need to leave by crossing a road, then ensure that there is a Scouter/Officer appointed to that role of safely crossing the Wolf Cubs/Junior Scouts. PARENTS - should be asked to ensure that they are there on time to deliver and collect their child before and after each meeting, but still ensure that there is at least one Scouter/Officer on any exit door to supervise the arrival and departure of the Wolf Cubs/Junior Scouts at each meeting. In addition sections of the 'Highway Code' appropriate to pedestrians or other activities that the Wolf Cub Pack might be involved in (cycling as an example) should be taught and practiced. Wherever possible one of the Scouters/Officers in the Wolf Cub Pack should be trained in First Aid and preferably hold a valid STA 'Activity First Aid' and 'Emergency First Aid At Work' Certificate, or have attended a First Aid Course offered by the British Red Cross or similar authority to the same level. On occasions it might be considered appropriate to hold a 'SIXERS' COUNCIL', an informal meeting of Wolf Cub Scouters/Officers, the Sixers, and, if desired the Seconds. The function of the 'Sixers' Council' is to discuss internal administrative and programme matters and for the Cubmasters consult the Sixers over these. It is advisable that a 'WOLF CUB COUNCIL' meeting should be held at regular intervals. This is an informal meeting of the Wolf Cub Scouters/Officers with any other adults working with the Section, to discuss programmes and activities. Membership subscriptions should be levied on the individual Wolf Cub/Junior Scout. This should be determined by the Group Scout Master in consultation with the Cubmaster and should be a reasonable amount, bearing in mind local conditions and expenses incurred in running the Wolf Cub Pack as a part of the Scout Group. The monies must be properly accounted for and banked with the Scout Group Treasurer, and the monies expended at the discretion of the Group Scout Master in consultation with the Cubmaster. A float could be issued for the Cubmaster's accountable cash purchases for the Wolf Cub Pack. The Wolf Cub Pack cannot exist in isolation as it is, nor should be, it must be a Section of a Scout Group (unless a new group just forming with Wolf Cubs only to start with). There must be contact and interactions with the Beavers, Wolf Cub Pack and the Scout Troop on regular occasions to show a good Scouting example to the younger Sections, as well as knowing other Section Scouters/Officers and members of other Sections that they are members of a family in Scouting. Combined activities are very important and all Wolf Cubs should fully support these that may be organised by the Scout Group, such joint activities as parades; hikes; parent and members games; fetes and fund raising; Christmas parties, etc.